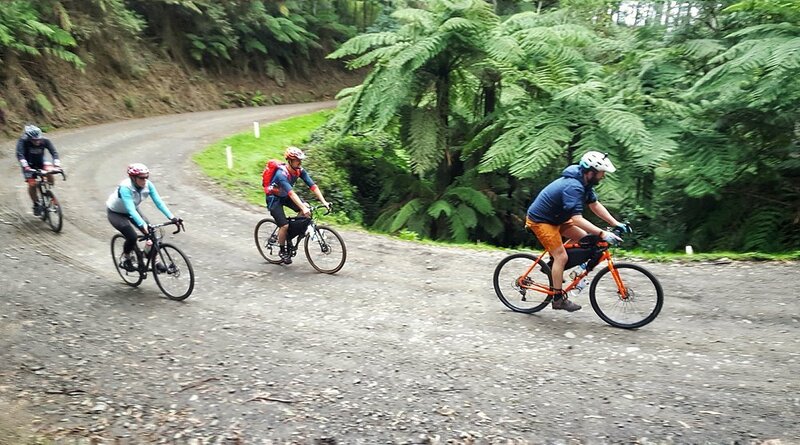 This ride follows the spine of the Strzelecki Ranges in South Gippsland, taking you through a variety of landscapes including rolling pastoral land, shady pine plantations, tall mountain ash forests and cool temperate rainforest. On clear days you will have views of the coast and Wilsons Prom to the south, and to the north, the Latrobe Valley and the alps. The first and last part of the ride are on regional roads that carry some traffic, though not a lot, while the middle section traverses most of the Grand Ridge Road, which is generally very quiet. Overall you will have to deal with little traffic. Although there is a decent amount of climbing involved, the grades are always gentle, meaning it’s an easier ride than its numbers might suggest. Log trucks use parts of the Grand Ridge Road, which means the gravel is quite chunky in places, so you will benefit from widish tyres (I would recommend 32mm or wider). Sharing the road with log trucks sounds scary, but they are infrequent and can be heard coming from a mile off, giving you plenty of time to move to the side. Also be aware that, although the Grand Ridge Road is signposted all the way along, it sometimes makes unexpected turnoffs onto what appear to be side roads; so pay attention to those signs. The ride can be done in either direction, but doing it west to east will take advantage of the prevailing south-westerly winds. Overall this is a charming and varied ride through a quiet and beautiful corner of the state. Grand Ridge Brewery, Mirboo North (km55)-one of Australia's older and (in my opinion) best craft breweries. Delicious brews await. Tarra Bulga National Park (km126)-home to many waterfalls and pristine rainforest. 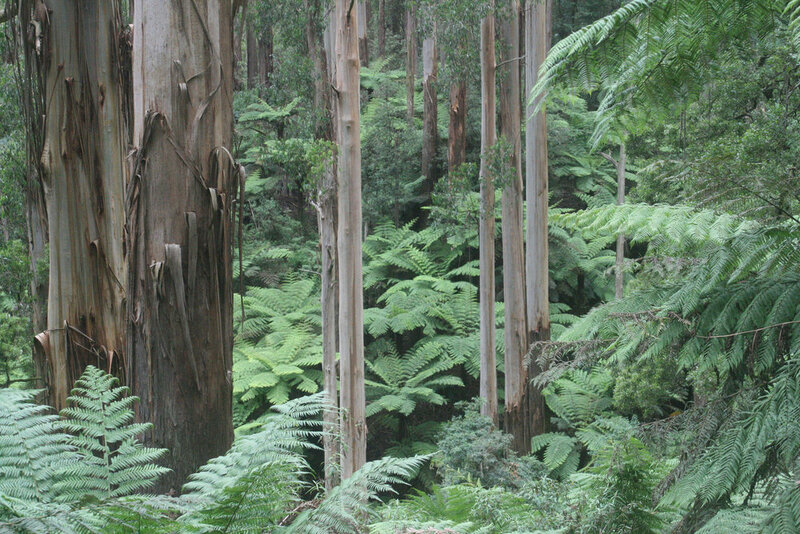 I highly recommend meandering through a moist, ferny gully and taking in that cleansing mountain air on one of the walking trails near the visitor centre. There is also very interesting information in the visitor centre about the natural and human history of the area. Mount Tassie (km130)-the highest point in the Strzeleckis at over 700 metres. Unfortunately there is no chalet at the top, only a communications tower, but you will have great views of the Latrobe Valley and mountains beyond. 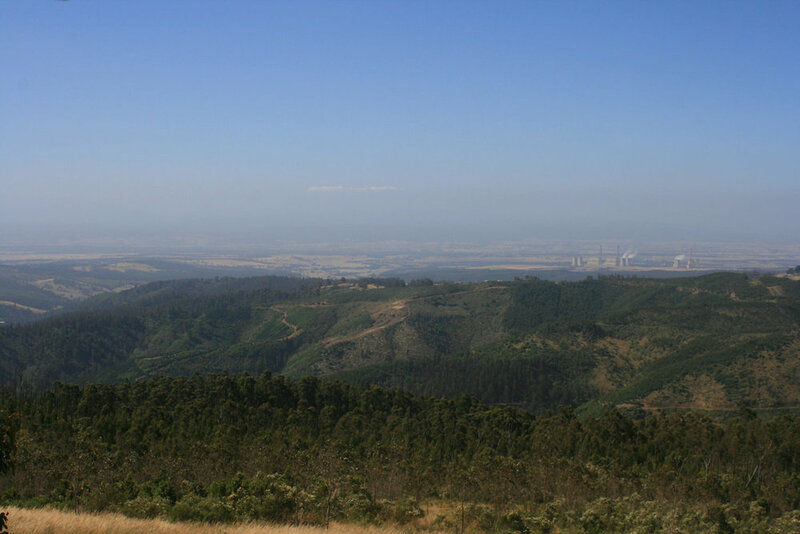 There is plenty of opportunity to bush camp in forested areas, roughly between km80 and km120. A small clearing at the old Gunyah town site (km84) is a nice little spot. There's a sign marking it. 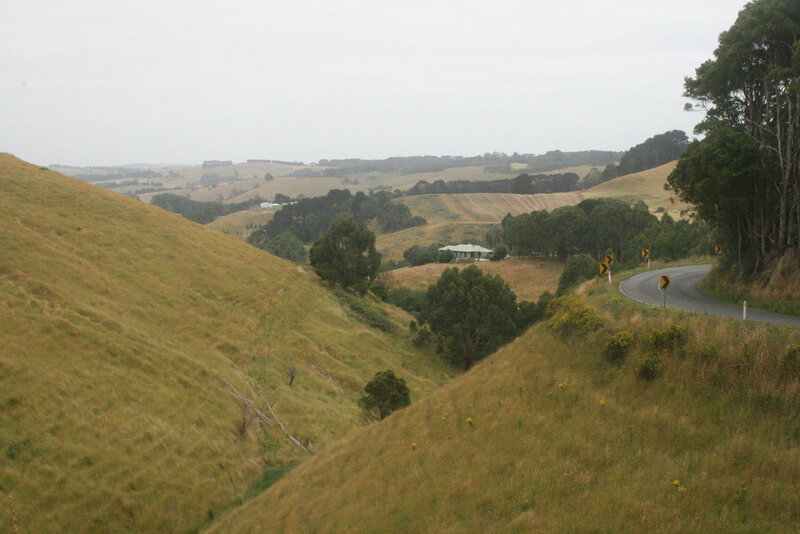 Summer is a good time to go because it's relatively cool in the Strzelecki Ranges, and it's not a big tourist hot spot so the roads remain fairly quiet in holiday season. The Strzeleckis have a cool and moist climate, and often get some snow in winter, so take your cold weather gear if you're going outside of summer. The start and end points of the ride, Warragul and Traralgon, are serviced by V-line trains every hour or so. UBD Gippsland Discovery and Wilsons Promontory-covers whole ride but I don't know how good the scale and detail are.